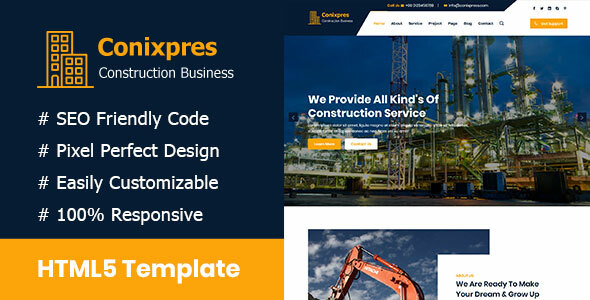 Conixpress || Construction Business HTML5 Template, Build with worlds most popular responsive CSS framework Bootstrap. This is a clean and modern template that you can use building company, construction, construction company, constructor, contractor, corporate, engineering, handyman, industry, painter, real estate, architecture, builder, company and any kinds of construction Service. It has a lot of features and responsive pages. No, Is not WordPress theme, Conixpress || Construction Business HTML5 Template, That can be used as website template. You can’t install it WordPress.